When it comes to smoking, we’ve all been reminded constantly of the effects it can have on our overall health. In most cases, lung cancer is often the disease of choice that is a result of smoking. However, the damaging effects of smoking don’t stop there. Do you know the negative effects smoking can have on your oral health as well? Stained teeth and bad breath are just the beginning. At the McAllen Orthodontic Group, we’ll help you understand the true cost of smoking as it relates to your teeth, gums and oral health. It starts with inflammation of the gums. If left untreated, the inflammation can lead to serious damage of the gum tissue, tooth loss and even bone loss in the jaw. Serious infections can also happen if the bacteria from any of the above mentioned get into the bloodstream. It is important to note that gum disease in those who smoke can be harder to treat. Smoking doubles the risk of developing gum disease due to the overwhelming number of toxins it introduces into the mouth. One effect smoking can have on oral health that isn’t always talked about it that it can produce white patches on the roof of the mouth. These are called stomatitis nicotina, or smoker’s keratosis. There is still much to learn about this condition, but one theory is that the white patches could be the result of inflammation of the mucous glands in the mouth. While it usually isn’t painful, it can be pre-cancerous which is a major concern. Awareness of oral cancer is becoming increasingly popular. Studies show that four of every five people diagnosed with oral cancer smoke or chew tobacco. Oral cancer is cancer that affects any of the tissues in the mouth and throat. Early symptoms can be caught early during a dental exam and include unusual white patches, persistent sores or pain, difficulty chewing or swallowing, swelling, numbness, and the sensation of having something lodged in the throat. Patients undergoing orthodontic treatment should be especially cautious of smoking as it can be worse for both oral health and treatment. Unhealthy oral tissues due to smoking don’t allow the teeth to move into their proper positions as they should – making treatment times longer than usual. Don’t think you’re out of the woods if clear aligners are part of your treatment plan. Smoking can stain invisible aligners just like it can stain teeth around the brackets. When the braces come off, unflattering white patches will be highly visible. 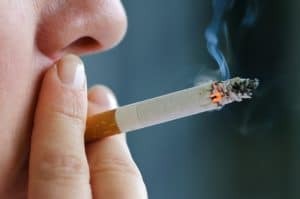 The positive side to all of this is that smoking is a 100% preventable cause of all the oral problems mentioned earlier. Even those who have been smoking for some time can significantly improve their chances of avoiding serious oral complications by quitting. For more information on how to quit smoking, visit the CDC’s website. We strongly advise smokers to schedule regular dental exams (sometimes more than twice per year) to ensure a healthy smile. Don’t hesitate to contact our office for questions on how smoking is affecting your orthodontic treatment.